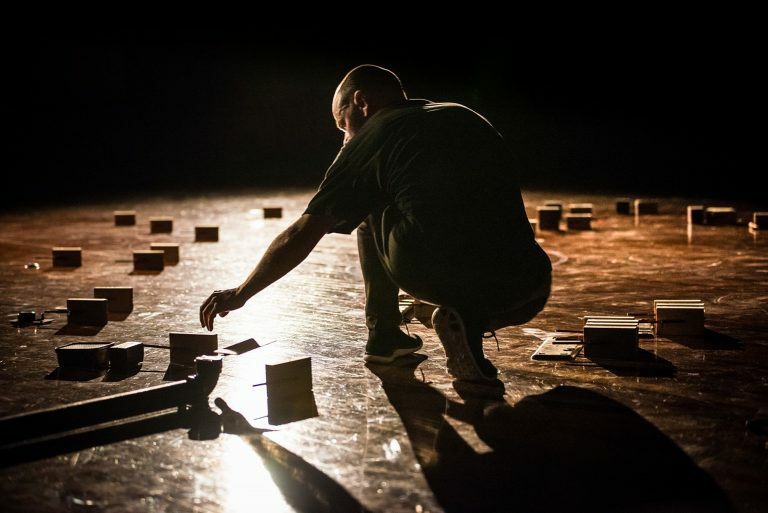 A spellbinding mix of classic b-boy moves and contemporary dance, Australian choreographer Antony Hamilton and sound artist and dancer Alexander Macindoe’s Bessie Award-winning MEETING uses a mechanically improvised score as the starting point for a mesmerizing dance spectacle. On a bare stage, sixty-four tiny robots — small rectangular machines holding sharpened pencils that they tap against the floor — encircle two dancers, clad simply in black and gray. Controlled at random by a computer algorithm, the robots tap rhythmically on wooden, metallic, plastic, or ceramic surfaces, creating a pointillist symphony of sound that suggests a gamelan ensemble playing fractured hip-hop beats. The dancers in the center of the circle — leading-edge Australian choreographer Antony Hamilton and sound artist and dancer Alisdair Macindoe, who made and programmed the robots — respond to the music with movement, translating the mechanically improvised score into a mesmerizing dance spectacle. 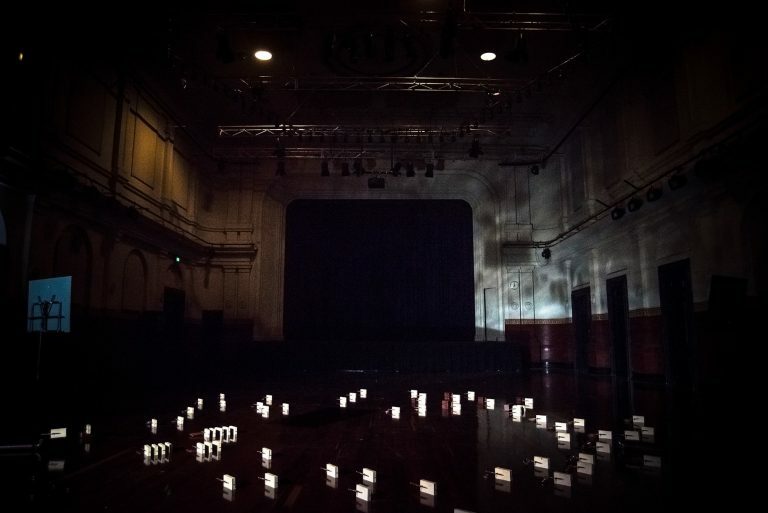 This is a rare American performance of MEETING, first unveiled at Australia’s Dance Massive festival in 2015, and recently awarded two Bessies for Outstanding Production and Outstanding Musical Composition/Sound Design. A spellbinding mixture of classic B-boy moves and contemporary dance, MEETING synthesizes disparate movement traditions with breathtaking control and precision. “There are moments when you query whether it is man or machine that you are witnessing in the spotlight,” marveled Australian Stage. 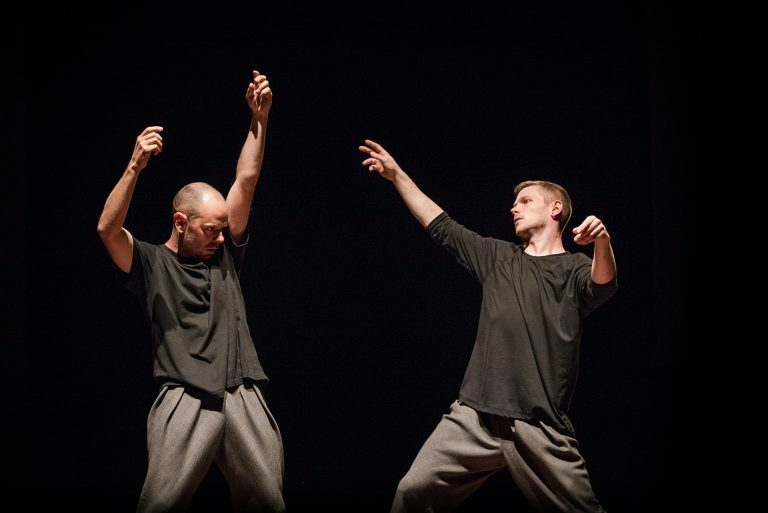 Indeed, as Hamilton and Macindoe flow in and out of perfect unison, their dance set to robotically generated mechanical music explores the intersection of industry and art, artificial intelligence and the human body. Watch a trailer for MEETING. A bold new opera using the high-drama framework of opera and advanced technology to explore ideas of apocalypse, renewal, and survival in the modern age. MEETING Learn more on the artists' website. Duke Performances Calendar Explore the 2017–2018 season.